Me and a childhood friend were at the local baseball field at around 9:00 pm in Kingston, Ma. This night was clear but dark, not much of a moon. The area is nestled in the woods surrounded by trees and sparsely populated. As we started walking we got about to the pitchers mound when the sky in front of us flashed red. The flash was not like a lingering flash; it was extremely quick and seemed to span the horizon. My friend said” did you see that”. It was very strange, and the color was vivid. As we continued walking east, I noticed an object about 20’ on the horizon coming from our 11:00 position. 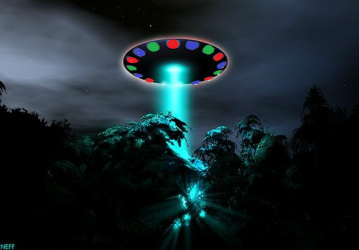 It had red, blue and green lights in a circular pattern that were spinning. It looked like nothing I had ever seen.